8:26am Officers assisted a subject in entering his locked vehicle in the 200 block of N. Walnut St.
8:39am A 911 hang-up call coming from the 700 block of Ann St. was investigated. 10:37am Officers assisted the Crawford County Sheriff’s Office by delivering a message in the 900 block of Elm St.
11:08am A report of an attempted burglary in the 300 block of Jump St. was received and remains under investigation. 11:53am A report of a burglary in the 200 block of Whetstone St. was received and remains under investigation. 1:53pm Officers assisted the Crawford County Sheriff’s Office by delivering a message in the 1400 block of Rosedale Ave.
1:55pm Officers spoke with a subject on station regarding a prior case. 3:00pm A resident in the 1100 block of Hopley Avenue reported his door kicked in but nothing stolen from his residence today. 3:02pm Karissa Smith, 41, was arrested at 117 W. Liberty St. on charges of Possession of Dangerous Drugs, Drug Paraphernalia, and Drug Abuse Instruments. She was issued summons to appear in court for all charges. She was transported to the Crawford County Justice Center for a probation violation. 4:03pm A resident in the 600 block of Woodlawn Avenue reporting receiving threats over social media. 4:14pm A two vehicle accident in the area of Mansfield and Whetstone Street was investigated. 4:22pm A resident in the 800 block of Clay Street reported receiving threats through text messaging by someone she knows. 5:36pm A resident in the 200 block of E. Mansfield Street reported her dog killed. 5:50pm A resident in the 500 block of W. Charles Street reported a package stolen from his porch. 7:42pm Four juveniles were warned to stay off private property on S. East St.
8:05pm A disturbance in the 600 block of N. Lane Street was investigated. 8:31pm A report of young juveniles playing in the street in the area of Prospect and Oakwood Avenue was investigated. Their mother was taking them inside for the night when officers arrived. 8:51pm Officers assisted a motorist with a disabled trailer. 10:29pm A resident in the 700 block of S. East St. reported being harassed. She was advised how to obtain a civil protection order. 10:41pm Officers assisted a motorist locked out of her vehicle in the 400 block of N. Sandusky Ave.
11:10pm Kenneth Meade, 58, was arrested for disorderly conduct. He was issued a minor misdemeanor citation and taken to the Crawford County Justice Center to be held until sober. 11:15pm A report of an intoxicated male in the 200 block of E. Mansfield St. was investigated. 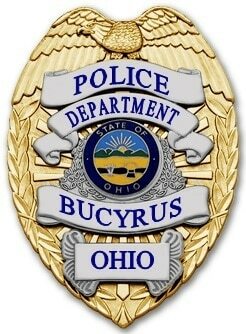 11:52pm Officers investigated a disturbance in the 400 block of Myers St.
1:43am A female was cited for driving under suspension in the 300 block of S. Lane St.
5:44am A verbal traffic warning was given in the area of S. Spring St. and W. Charles St.